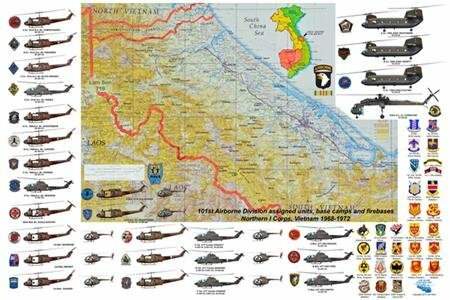 This highly detailed print depicts all units assigned to the 101st Airborne Division "Screaming Eagles" in Northern I Corps from 1968 to 1972. All aviation units are represented by aircraft type with markings, pocket patches and callsigns. Unit crests are shown for all other assigned units. Highly detailed area of operations map includes firebases and base camps.